Comedian/singer Stephen Lynch is back with his latest record, Lion, which will be released November 13. To support the new album, he will be embarking on a national tour starting November 8. Conveniently enough, the release date is also the date of his stop in Indianapolis, where The Front Row Report calls home. Needless to say, we will be there and so should anyone who appreciates good comedy and music. This tour and album are both highly-anticpated so this promises to be a great tour and we will be there to bring you photos and a review the week of the show. Lynch is notorious for singing about some of the most sensitive subjects in society (“Priest” was about the catholic priest scandals and“Special” was about a mentally handicapped friend, just to touch on a few). It seems like Lynch alternates between live releases and studio releases and what better way to release a new record than to release a double album, offering a live and studio record. This, my friends, is what we get with Lion. 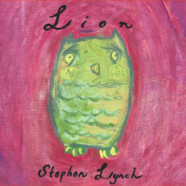 With Lion, the laughs start before you even open the album- the album is titled Lion but the artwork is of a sketched owl- clever. Lynch’s last record, 2009’s Three Balloons, was a change of pace for Lynch, using a full band, as all his previous releases featured just Lynch on guitar with some guest vocalists. Lion keeps the ball rolling with change as this one took me a little offguard but in a good way. The entire album has a softer, more camp-firey feel to it; almost a folksy feel. There’s a very peaceful feel to it and Lynch uses a backup female vocalist (a very good one, at that), banjo, mandolin, harmonica, organ, cello and more. When you factor that in with the off-the-wall lyrics of hilarity that ensue from Lynch, this is a home run. I would almost call this one a comedy-musical masterpiece. We’ve got “Let Me In,” where you think the whole time Lynch is asking a girl to let him in, emotionally, and to open up to him. The truth is, we discover, that he’s outside, freezing, “cold as balls,” and he just wants inside. One of my personal favorites is “The Gathering,” where Lynch nicely pokes fun at the Juggalo culture of Insane Clown Posse. Then you have the live portion of the album, which features Lynch performing each song from Lion for a live audience, most likely for the first time. This is where we hear him bantering with other performers and interacting with the crowd better than ever. Lynch is definitely on his game with Lion. Lion is Lynch at his finest. The songs may not be as outwardly offensive but he does something that’s rare in comedy these days- he makes you really think about the jokes, which I applaud him for.